1 – “Print Your City” bringing a 3D printer to convert “plastic waste” into a few pieces of urban furniture’s. This is called downgrading, it can only be done once, therefore it is not circular. Coca-Cola, Pepsi and Nestle produce all together more than half of the 186 billions plastic bottles put on the market every year. If we would print urban furniture’s with all the plastic bottles they produce, we would drown under plastic benches in our cities. 2- “Recycle at the Beach” which is a beach clean-up to ‘boost awareness for recycling and educate people on how to recycle’. Recycling is very low on the waste hierarchy, for a reason: recycling (meaning re-processing material into new ones) requires lots of water and energy to make and transport, and recycled plastic looses its quality through multiple cycles and can only be recycled a limited amount of time. The main goal of a clean-up should be littering prevention and awareness in reducing single-use plastic consumption. 3 – “Interactive recycling and circular economy center” to educate people and schools on the values of the circular economy and a new approach to waste management. Which is a good thing, providing that this center will not be used to misinformed citizen on a false definition of circular economy – as shown in the 2 previous components of its program. Coca-Cola is therefore through its initiative trying to make it ‘ok’ to produce billions of bottles which will last for hundred of years in the environment and that are designed to be used only once. 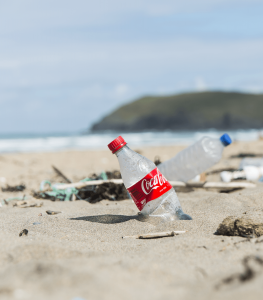 Coca-Cola is lobbying all over the world against the return of a Deposit Return Scheme, even for plastic bottles, which shows its will to outsource the pollution it generates to consumers/citizen and local government and not take any responsibility for it. As long as Coca-Cola produces packaging designed to be used ONCE and that last for centuries, it can not pretend to encourage a true circular economy. Zero Waste Europe and its 28 members are working with over 400 municipalities all over Europe that have taken on the challenge of the ambitious Zero Waste Municipalities Masterplan. What defines a “Zero Waste Municipality” are the firm and verifiable commitments to move towards zero waste and the results which that delivers. Becoming a Zero Waste city is about changing the way waste are dealt with, starting with reduction of residual waste, increase in composting, increase in reuse of secondary material, and at least increase in recycling – with monitoring and evaluation of results throughout the implementation phase. It usually starts by implementation of door-to-door collection of sorted waste. The entire city and its citizen are involved in such transformation, and it can take months to years to implement. Giving a 3D printer to a city and organizing a cleanup does not make it a Zero Waste City. If Coca-Cola or a municipality in Montenegro is interested in truly becoming a Zero Waste city, we recommend them to read the Zero Waste Master Plan and/or to contact us. Until then, we would recommend any municipality in Montenegro (or elsewhere) as well as any respectful NGO’s to stay away from such partnership with Coca-Cola. Tell Coca-Cola to stop blocking plastic solutions!